Asset management is a vital source of economic growth, providing a link between investors seeking beneficial savings vehicles and the real economy's financing needs. At the end of the first quarter of 2017,2 the assets managed by the Portuguese asset management industry amounted to €92,768,700,000. Discretionary mandates are generally invested more conservatively, with more exposure to low-yield debt, whereas investment funds tend to be more heavily invested in equity. The key factor behind this large proportion of discretionary mandates in Portugal is the significant number of financial conglomerates operating an asset management company that carries out a group's general asset management by way of discretionary mandates. As a result of the financial crisis and the consequent collapse in share prices, asset managers saw a sharp fall in the value of assets under management (an approximately 30 per cent fall since 2009). 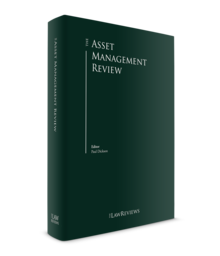 An important aspect of the organisation of the Portuguese asset management industry is the extent to which asset management firms operate as stand-alone companies or form part of financial services groups. The activities of these groups can be dominated by a particular type of financial services, or may consist of a mix of asset management companies, banks and insurance undertakings. The RGOIC combines and homogenises the regulation of collective investment undertakings in securities and real estate, removing some of the legal asymmetries applicable to these undertakings. Hence, there are now two main categories of collective investment undertakings: UCITS, and an alternative collective investment undertakings concept that includes alternative investment undertakings in securities (non-UCITS), real estate investment undertakings and investment undertakings in non-financial assets. Collective investment undertakings are supervised by the CMVM, whereas their managing entities are supervised by both the CMVM and the Bank of Portugal. Given their hybrid nature as both insurance and investment products, unit-linked products are regulated under Decree Law No. 94-B/98 of 17 April (which establishes the legal framework on the taking up and pursuit of insurance and reinsurance activities in the EU) and Decree Law No. 72/2008 of 16 April (which establishes the legal framework applicable to insurance contracts), in respect of their insurance component; and CMVM Regulation No. 2/2012, in respect of their marketing as investment products. Hence, unit-linked products are supervised by the insurance sector's regulator, the Portuguese Insurance and Pension Funds Supervisory Authority (ASF), in respect of their insurance component, and by the securities market regulator, the CMVM, in respect of their marketing. The legal framework for pension funds and their respective management entities is set out in Decree Law No. 12/2006 of 20 January, implementing Directive 2003/41/EC into Portuguese law. Pension funds are supervised by the ASF. The legal framework on private equity and venture capital is set out under Law No. 18/2015 of 4 March, partially transposing the AIFMD into Portuguese law, and CMVM Regulation No. 3/2015. This sector is supervised by the CMVM. Portugal's supervisory approach is based on three authorities: the Bank of Portugal, the ASF and the CMVM, which are distinct and independent from each other, forming a system referred to as institutional supervision. The system entails a supervisor for each financial sector: banking, insurance and securities (including collective investment undertakings). Notwithstanding the broad separation, the fact that activities carried out by financial entities are diversified and interact in significant ways renders the supervision under this model somewhat complex. Indeed, banks have been carrying out transactions in capital markets and acquiring capacity to mediate insurance, thereby extending the range of services provided. There has been a general increase in the integration of financial services offered by financial conglomerates providing services in sectors such as banking, insurance and asset management. Moreover, prudential supervision, traditionally linked to the banking sector and commonly associated with the goal of ensuring the financial health of supervised entities, and the stability of the financial system as a whole, have also become regulatory objectives of the securities market, where idiosyncratic risk is particularly significant, especially in the context of clearing systems and counterparty structures for securities transactions. Conversely, the Bank of Portugal has the authority to supervise certain aspects of the conduct of credit institutions and financial companies, which means that this kind of conduct of business supervision is not carried out exclusively by the ASF and the CMVM. In Portugal, under the umbrella of 'collective investment undertakings', the main structures used for asset management are investment companies and investment funds. Both these structures involve the collective investment of equity raised from investors, and are subject to a risk-sharing principle and the pursuance of the investor's exclusive interests. Investment companies are entities with legal personality that carry out asset management activities, or that purport to manage investment funds that pursue such activities. In contrast, investment funds are segregated assets lacking legal personality that are managed by a third entity – a managing entity (which may be an investment company) – and are subject to an investment policy that is determined upon its creation. In terms of structure, investment funds may be open-ended or closed-ended. Open-ended funds are represented by a variable number of units, being the unitholders entitled, in accordance with the terms established in the fund's incorporation documents, to their redemption and corresponding net asset value. They are thus associated with higher liquidity. Closed-ended funds have a fixed number of units and hence a limited number of participants, who, as a general rule, cannot redeem their units. Another structure to consider is the exchange-traded fund (ETF), which is an investment fund characterised by, on one side, an investment policy based on replicating an index or a basket of securities and, on the other side, its admission to trading on organised markets, with higher liquidity resulting therefrom. Taking into account the concerns of European regulators regarding these instruments, it is likely that ETFs will soon be subject to more detailed regulation, both at the international and domestic levels. Unit-linked products offered by insurance undertakings are becoming increasingly popular as an asset management structure. They are life insurance agreements having a variable capital in which the premiums paid by the policyholder are invested through an investment fund. When the relevant event occurs, the proceeds to be received by the beneficiary appointed by the policyholder will depend, totally or in part, on a value of reference represented by the fund's units. It is up to the insurance undertaking and the policyholder to agree on the terms and conditions of any redemption rights attributed to the latter. external funds, consisting of regular collective investment undertakings offered by the banks and the fund industry, which the insurance undertaking makes available to the policyholder in the unit-linked product. The units or shares representing these collective investment undertakings are acquired by the insurance undertaking as underlying investments in the unit-linked product. One of the most attractive features of unit-linked products is the fact that their beneficiary is not subject to succession laws either in respect of his or her appointment as a beneficiary or in respect of the determination of the amount to be paid to him or her by the relevant insurance undertaking. The policy proceeds from the unit-linked product will not form part of the estate of the deceased, and the beneficiary will receive them directly from the insurance undertaking and not through the life assured. On aggregate, institutional investors account for approximately 70 per cent of assets under management in Portugal, with retail clients accounting for the remaining 30 per cent, reflecting Portugal's ability to attract large institutional mandates from insurance companies. In this regard, assets managed for retail clients suffered a much sharper decline in 2008 than those managed for institutional clients. This occurred for two main reasons. First, the equity exposure of financial portfolios tends to be higher for retail clients than for institutional investors in general. This is explained by the fact that European households tend to hold the majority of their financial wealth in cash, savings accounts and retirement products, which tend to be low-risk stores of value, while resorting to the expertise of asset managers for managing the portion of their savings that is invested in equity and balanced funds, shares and other types of assets carrying more risk. Second, insurance companies and pension funds – the two largest categories of institutional clients – primarily invest in debt securities and investment funds, which are managed in-house or by third-party asset managers. The EU PRIIPs Regulation introduces the key investor information document (KIID), a standardised pre-contractual disclosure document applicable to issuers and distributors of PRIIPs, which are investment products with an investment element such as investment funds, life insurance policies and structured deposits. The EU PRIIPs Regulation came into force on 29 December 2014, and has applied directly in all Member States since 31 December 2016. Until the applicability of the EU PRIIPs Regulation, CMVM Regulation 2/2012 on complex financial products was the legal regime applicable to PRIIPs in Portugal. However, due to the lack of harmonisation between Regulation No. 2/2012 and the EU PRIIPS Regulation, the CMVM, on 4 October 2018, issued a circular letter by means of which it clarified the legal regime that would be applicable to PRIIPs under its supervision. In accordance with the circular letter, until the CMVM issues its own Portuguese PRIIPs Regulation, Regulation No. 2/2012 is to be repealed and prevailed over by the EU PRIIPs Regulation and the latter, jointly with the circular letter, will set out the sole legal regime applicable to PRIIPs in Portugal. Although a draft version of such Portuguese PRIIPs Regulation has already been submitted to public consultation, the CMVM has yet to approve and issue a final version of such Regulation, under which all matters regarding PRIIPs will be dealt with in accordance with the legal regime arising from both the circular letter and the EU PRIIPs Regulation. The incorporation of open-ended funds is subject to authorisation by the CMVM. After the authorisation is granted it can be withdrawn if certain circumstances are met, notably if, within the first six months of activity, there is no dispersion of the units by a minimum of 100 unitholders in the case of UCITS funds, or by a minimum of 30 unitholders in the case of non-UCITS funds, and if a single unitholder holds up to 75 per cent of the total units. Except in the case of funds that raise equity solely from qualified investors, a prospectus and a KIID must be prepared for each open-ended fund and delivered to its subscribers prior to the subscription of the units. Each open-ended investment fund might be divided into different compartments, named sub-funds. The assets of each compartment are independent and segregated from the investment fund, as well as from the assets pertaining to other compartments. The creation of each compartment is subject to authorisation from the CMVM. The obligation to ensure a minimum portion of investment in assets that generate periodic revenues (such as rents) is now established. The incorporation of closed-ended funds is also subject to authorisation from the CMVM, which may be withdrawn on the same conditions as for open-ended funds. As regards the above-mentioned dispersion requirement, the minimum number of participants to consider is 30. The term of closed-ended funds may not exceed 10 years, although such term can be extended for a period up to the initial term through a resolution of unitholders, provided that the unitholders that vote against such resolution can have their units redeemed. If no term is established, authorisation for the creation of the fund will only be granted if the incorporation documents foresee that the units will be listed and admitted to trading on a regulated market. A resolution of unitholders is required to amend certain key aspects of a fund's status quo, including any change to its investment policy or any change allowing the entrance of new unitholders by way of an increase in the number of the fund's units. In this case, unless otherwise established in the incorporation documents, unitholders of closed-ended funds hold a right of first refusal in connection with the subscription of new units. For closed-ended funds that are incorporated through a public offering of units, a prospectus and a KIID must be prepared and delivered to its subscribers prior to the subscription of the units. As in the case of open-ended investment funds, and under the same regime, closed-ended funds might also be divided into different compartments. Both open-ended and closed-ended investment funds are offered and managed by a management entity, which may be a collective investment undertakings management company (management company) or, in the case of closed-ended funds, certain credit institutions with a minimum net worth of €7.5 million. The incorporation of collective investment management companies must be authorised by the Bank of Portugal, whereas the carrying out of the financial intermediation activity of managing collective investment undertakings is subject to registration with the CMVM. Management companies of both securities investment funds and real estate investment funds must have a share capital of at least €125,000. Management companies of both securities and real estate investment funds must still hold additional equity corresponding to 0.02 per cent of the value of assets under management in excess of €250 million. Subject to prior authorisation from the CMVM, even if they hold assets under management in excess of €250 million, management companies will still be able to hold additional equity for an amount lower than that imposed by the general rule (up to 50 per cent lower), if the difference is secured by a guarantee or bond issued for their benefit by a credit institution or an insurance company incorporated in the EU. Without prejudice to the foregoing, the sum of the initial share capital of the management company and the additional equity must not exceed €10 million or fall below 25 per cent of the total operating costs incurred in the previous year. As for management companies managing real estate funds, they must hold additional equity not inferior to 0.5 per cent of the net value of assets under management up to €75 million of the net value of assets under management; and if the net value of assets under management exceeds €75 million, 0.1 per cent of such excess value. In 2010, Portuguese legislation established a legal framework for securities investment companies and real estate investment companies, which differs from the framework for securities investment funds and real estate investment funds, given that the former structures have legal personality. Investment companies may be self-managed (i.e., managed by their own corporate bodies) or managed by another company (either a collective investment company or certain credit institutions having a minimum net worth of €7.5 million). Investment companies may be categorised as having either variable or fixed capital. Investment companies with variable capital are the equivalent of open-ended investment funds, whereas investment companies with fixed capital are the equivalent of closed-ended funds. As with investment funds, the incorporation of investment companies must be authorised by the CMVM. Again as with investment funds, each investment company might be divided into different compartments. The assets of each compartment are independent and segregated from the investment company, as well as from the assets of other compartments. The creation of each compartment is subject to authorisation by the CMVM. Securities investment companies must have a share capital of at least €300,000, whereas real estate investment companies must have a share capital of at least €375,000. The additional equity requirements applicable to both these types of companies, when they are self-managed, are the ones described above, respectively, for management companies of securities investment funds and management companies of real estate investment funds. Hedge funds are usually characterised as investment funds that do not raise equity from the public, having only qualified investors as unitholders. Broadly speaking, such funds are subject to the same rules as the other securities investment funds, except in respect of the duty to disclose a prospectus and a KIID, which does not apply to them. The incorporation of insurance undertakings that offer and manage unit-linked products is subject to authorisation by the ASF. Without prejudice to the authorisation required for the incorporation of collective investment undertakings in which they might be invested (see Section III), unit-linked products themselves are not subject to authorisation by or registration with any regulatory entity. As a result of the dual supervision model applicable to unit-linked products resulting from their nature as both insurance and investment products, they are qualified as complex financial products, meaning that, inter alia, a KIID may have to be made available to the relevant investors or policyholders, and their marketing materials may be subject to prior approval by the CMVM. In line with the Portuguese legal framework, the assets of pension funds exclusively cover the pension plans underlying the funds, the payment of management and deposit remuneration, and the payment of insurance premiums. The obligations under pension plans are borne exclusively by the fund's assets or by the assets of each specific compartment of the fund whose net assets are the only security. c mixed plans, which combine features of both types (a) and (b). With regard to the financing structure, pension plans can be divided into contributive plans (involving contributions from participants) and non-contributive plans (which are financed exclusively by the associate). Pension funds may be structured as either open-ended or closed-ended funds. Open-ended pension funds do not require a connection between the participants: participation is exclusively dependent on acceptance by the managing entity. Closed-ended funds relate to one or more associates with a common corporate, associative, professional or social nature interest. When there is a plurality of associates, authorisation is required from each associate to admit new participants. Pension funds may be managed by companies incorporated exclusively for that purpose, or by insurance undertakings that legally operate in the life insurance sector and hold a permanent establishment in Portugal. The legal framework for private equity and venture capital set out in Law No. 18/2015 of 4 March, partially transposing the AIFMD into Portuguese law, aims explicitly at encouraging the growth of private equity and venture capital activities as a support tool for corporate start-ups, restructurings and expansions, with a particular emphasis in the scientific and technological fields. In order for private equity and venture capital activities to benefit from such regime, they must comply with the requirements set forth therein. The legal framework applies to private equity and venture capital activities, defined as follows: acquiring, for a limited period of time, equity and debt instruments in companies with high development potential in order to benefit from future appreciation. To benefit from this regime, private equity and venture capital activities can be carried out through three different types of structures: private equity companies, private equity funds and individual private equity investors assuming the form of single-person limited companies. Supervision is carried out by the CMVM, with whom the above entities must register (in a simplified procedure) before starting activities. However, if those entities do not raise equity from the public and their equity is solely held by qualified investors (or by investors that, independently of their nature, subscribed at least €500,000), a simple communication to the CMVM before starting activities will suffice. Private equity and venture capital companies must have own funds corresponding to 0.02 per cent of the amount of the net value of assets under management exceeding €250 billion. invest in venture capital for a period of time (continuous or combined) exceeding 10 years. Private equity funds are independent and segregated assets with no legal personality, and belong to the respective unitholders. They are managed by managing companies, which may be private equity companies, regional development companies and entities legally able to manage closed-ended securities investment funds. Law 18/2015 also instituted social entrepreneurship funds and social entrepreneurship companies aimed at investing, for limited periods of time, in equity and debt instruments issued by entities developing suitable solutions to social matters; and specialised alternative collective investment undertakings directed solely at qualified investors and aimed at investing in assets of any kind for limited periods of time (each asset may not represent more than 30 per cent of the net asset value of the relevant undertaking). As of 1 July 2015, Decree-Law 7/2015 of 13 January 2015 introduced new special tax rules only for income derived by securities investment funds that are created under Portuguese law. Thus, the special rules do not apply to income derived by non-resident securities investment funds (which are taxed under the same rules as applied to other non-resident entities). Under the special tax regime, Portuguese-resident securities investment funds are, as a general rule, subject to corporate income tax (CIT) on their annual taxable profits at the standard rate of 21 per cent. However, investment and real estate income, as well as any capital gains obtained by investment funds, are not subject to CIT, except if said income is distributed or due by companies resident in a listed tax haven or resulted from the transfer of a shareholding in such a company. Portuguese-resident securities investment funds are also subject to stamp tax, levied quarterly on their global net asset value (i.e., the average net asset values notified to the CMVM or published by the management entity of the fund, excluding the value of units in funds or shareholdings in investment companies), at a rate of 0.0125 per cent or, in the case of funds investing in money market instruments or deposits, at a rate of 0.0025 per cent. Income derived by a Portuguese-resident company from units held in Portuguese securities investment funds is subject to withholding tax at a rate of 25 per cent on account of the final tax due. Income derived by a Portuguese-resident individual from units held in a Portuguese securities investment fund is subject to withholding tax at a rate of 28 per cent in the case of profits distribution or redemptions, and to personal income tax (PIT) at a special rate of 28 per cent in the case of a disposal of units in a securities investment fund. Resident investors may opt to aggregate the income with the rest of their taxable income, thus being subject to the general PIT rates. In this case, any withholding tax paid has the nature of a payment on account of the final tax due by the investor. As a general rule, an exemption applies to income paid by a securities investment fund to non-resident individuals, as well as to non-resident companies. The exemption does not apply to investors resident in a listed tax haven or, in the case of companies, if more than 25 per cent of the share capital is held, directly or indirectly, by Portuguese-resident companies or individuals, except where the non-resident companies are resident in another EU Member State, in an European Economic Area (EEA) State (which is bound by administrative cooperation in tax matters similar to the regime established within the EU) or in another state that has a double tax treaty with Portugal in force that foresees exchange of information procedures. These rules (regarding both taxation of the income and gains derived by securities investment funds, and taxation of investors regarding the income and gains derived with respect to their units) also apply to securities investment companies created under Portuguese law. The new rules applicable to Portuguese securities investment funds also establish a transitory regime in which income generated before 1 July 2015 and only paid or realised after that date is separated and subject to a specific set of rules that ultimately leads to a proportionate application of the regimes in force before and after 1 July 2015. Under the new special tax rules, only income derived by a real estate investment fund created under Portuguese law is generally subject to CIT and stamp tax on the same terms referred to in Section VII i. Income derived by a Portuguese-resident company from units held in Portuguese real estate investment funds is subject to withholding tax at a rate of 25 per cent on account of the final tax due. Income derived by a Portuguese-resident individual from units held in a Portuguese real estate investment fund is subject to withholding tax at a rate of 28 per cent in the case of profits distribution or redemptions, and is subject to PIT at a special rate of 28 per cent in the case of a disposal of units in the real estate investment fund. Resident investors may opt to aggregate the income with the rest of their taxable income, thus being subject to the general PIT rates. In this case, any withholding tax paid has the nature of a payment on account of the final tax due by the investor. Regarding income paid by Portuguese real estate investment funds to non-resident individuals or companies, said income is subject to a final withholding tax at a rate of 10 per cent in the case of profits distributions or the redemption of units, and to a special final tax rate of 10 per cent in the case of gains arising from the disposal of units in the real estate investment fund. This reduced rate does not apply to investors resident in a listed tax haven or, in the case of companies, if more than 25 per cent of the share capital is held, directly or indirectly, by Portuguese-resident companies or residents, except where the non-resident companies are resident in another EU Member State, in an EEA State (which is bound by administrative cooperation in tax matters similar to the regime established within the EU), or in another state that has a double tax treaty with Portugal in force which foresees exchange of information procedures. These rules (regarding both the taxation of income and gains obtained by real estate investment funds, and the taxation of investors regarding income and gains obtained with respect to investment units) also apply to real estate investment companies created under Portuguese law. The transitory regime established by the new rules applicable to Portuguese securities investment funds mentioned in Section VII.i also applies to Portuguese real estate investment funds. Under Portuguese law, income arising from unit-linked products issued by a Portuguese insurance company and paid to resident individual investors is subject to a final withholding tax at a rate of 28 per cent. Resident investors may opt to aggregate the income with the rest of their taxable income, thus being subject to the general PIT rates. In this case, the withholding tax paid has the nature of a payment on account of the final tax due by the investor. Income derived from unit-linked products issued by a Portuguese insurance company and paid to non-resident individual investors is always subject to a final withholding tax at a rate of 28 per cent. However, these investors may benefit from a treaty-reduced tax rate applicable to the payments if they are resident in a state that has signed a double tax treaty with Portugal. A partial exemption for resident and non-resident individual investors is applied on the income derived from unit-linked products issued by a Portuguese insurance company provided that at least 35 per cent of the premiums contractually due were paid during the first half of the term of the contract. As a result, for contracts in force for between five and eight years, only four-fifths of the income received is subject to PIT, and for contracts in force for more than eight years, only two-fifths of the income received is subject to PIT. Income derived by a Portuguese-resident company from unit-linked products is subject to Portuguese CIT at the standard rate of 21 per cent, possibly added to a state surcharge, levied on taxable profits in excess of €1.5 million at a rate of up to 9 per cent, and a municipal surcharge also levied on taxable profits at rates of up to 1.5 per cent (depending on the municipality). As for non-resident companies, income derived from unit-linked products issued by Portuguese insurance companies is subject to a final withholding tax at a rate of 25 per cent. Again, the investors may benefit from a treaty-reduced tax rate as long as they are resident in a state that has a double tax treaty signed with Portugal. Income derived by pension funds created under Portuguese law is generally exempt from tax. As regards CIT, contributions made by a company to a pension fund for the benefit of its employees are, as a general rule, and provided certain conditions are fulfilled, deductible for CIT purposes. With regards to the taxation of income obtained by individuals from pension funds, different complex tax regimes apply depending on whether the contributions for the pension funds are made by the beneficiaries or by other entities (in particular by employers), on whether the income is received by means of a redemption or remission or as a pension, as well as on whether the individuals are Portuguese residents or are non-residents. Private equity companies are entitled to deduct from their taxable income (as computed after the deduction of any losses carried forward) investments made in companies with potential growth and capital appreciation. The deduction is limited to the sum of the CIT due in the previous five tax years (this deduction may be taken in the tax year in which the relevant investment is made, or otherwise in the following five tax years). Income earned by private equity funds created under Portuguese law is exempt from taxation. Income earned by resident individuals from units held in a Portuguese private equity fund is generally subject to a 10 per cent final withholding tax. However, individual investors may opt to aggregate the income with the rest of their taxable income, to be subject to taxation at the general applicable rate. In this case, the withholding tax paid has the nature of a payment on account of the final tax due by the investor and, in cases where the income distributed by the private equity fund includes income derived from a distribution of profits made by a company to the private equity fund or from the liquidation of a company, the investors may be entitled to deduct 50 per cent of that income for tax purposes, provided that certain conditions are fulfilled. As a general rule, income and gains derived by non-resident individuals from units in a Portuguese private equity fund are exempt, except when the non-resident individual is resident in a listed tax haven. In this case, the income will be subject to a 10 per cent final withholding tax. Income derived by a Portuguese-resident company from units held in a Portuguese private equity fund is generally subject to a 10 per cent withholding tax on account of the final tax due (the investors must aggregate this income with their remaining taxable income subject to the standard CIT rate, as applicable). Should the income distributed by the private equity fund include income derived from a profit distribution made by a company to the private equity fund or from the liquidation of a company, the investors may be entitled to deduct 50 per cent of that income for tax purposes provided that certain conditions are fulfilled. As a general rule, income and gains derived by non-resident entities from units held in Portuguese private equity funds are exempt from tax in Portugal (except in the case of non-resident investors resident in a listed tax haven; or income and gains derived by non-resident entities held directly or indirectly in an amount of more than 25 per cent by Portuguese residents, which will be subject to tax at a flat rate of 10 per cent). The legal framework regulating the creation and operation of different asset management structures in Portugal has recently been modified and is prepared to respond to difficulties arising from the financial crisis. In this regard, Portuguese legislation on asset management already grants the supervisors of Portugal's financial sector – the Bank of Portugal, the CMVM and the ASF – a wide range of powers to control and sanction the activities of asset managers under Portuguese jurisdiction. Furthermore, the legal framework for asset management for each sector establishes capital requirements designed to discourage excessive risk-taking. In particular, this is carried out through restrictions on the percentage of assets that may be invested in one sole entity and on the level of leverage that can be raised to finance the corresponding investment policy. 1 Carlos Costa Andrade and Marta Pontes are partners, Gerard Everaert and Duarte Araújo Martins are associates and Domingos Braga is a trainee at Uría Menéndez – Proença de Carvalho. 2 Asset Management Report, Portuguese Securities Market Commission, 1Q, 2018. 5 Regulation (EU) No. 1286/2014 of the European Parliament and of the Council of 26 November 2014.